Republic Day is one important day when India adopted a republic constitution, after gaining independence from Britishers in 1947. Republic Day is one of the most significant days in Indian history and is celebrated with fervour. Festivities take place all over the country and the whole country, which is so diverse in nature and colours; unites in just three colours, the colour of our flag. The grandest celebrations take place in the capital city of India, New Delhi. The entire Rajpath, venue of Republic Day celebrations is phenomenally festooned. The highlight of the entire celebration is the Republic day parade, and it deserves to be the one. It is so incredibly synchronized, patterned and beautiful that your eyes will find it hard to believe on the timing of all participants. Every year some special guest is invited to the country to share the special day with us. And this time, India is going to welcome Crown Prince of Abu Dhabi Sheikh Mohamed bin Zayed Al Nahyan. There are some other interesting things too, which are going to add grandeur to the Republic day celebrations and amplify its significance. 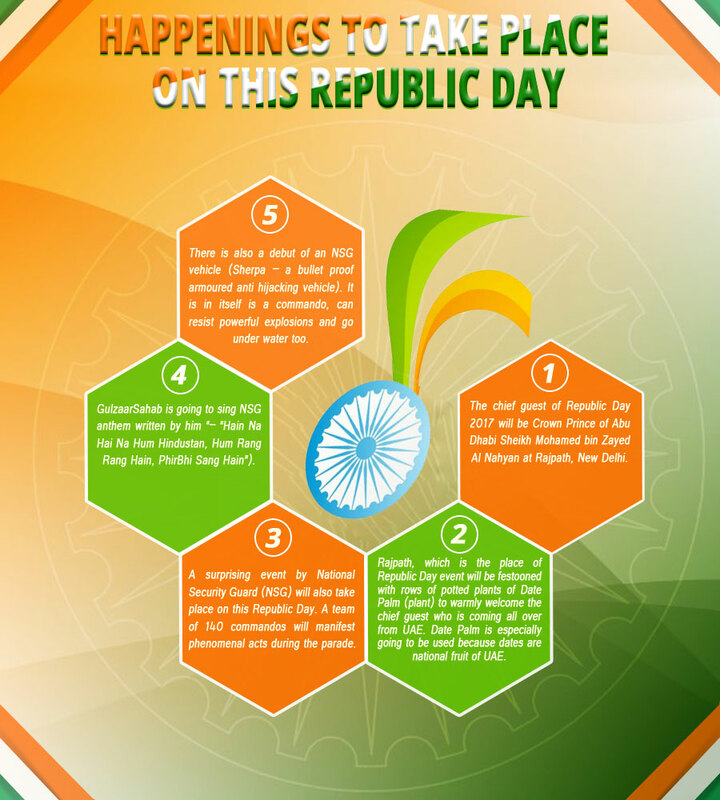 Go through this infographic to learn what all is going to happen on this Republic Day.